Home Mail Oh, yes they can! 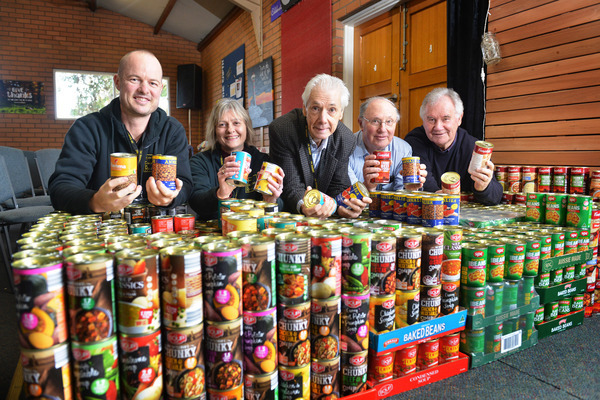 Belgrave South Baptist Church has donated an incredible 1078 cans of food to help the hundreds of people who are doing it tough this winter. The latest donation to the Dandenong Ranges Emergency Relief Service (DRERS) is in addition to the church’s generous donation of 1000 cans last month. Church Treasurer Ian Birchall said it was important to always consider others. “We just want to help the people who may be doing it tough in the hills and DRERS are the professionals in that field,” he said. The 1078 cans will be handed out quickly in the colder months. DRERS Manager Tania Bevan said rip-top food cans were suitable for people who were homeless and had insufficient resources with which to cook. The service is a not-for-profit organisation located in Belgrave, assisting people who are homeless and other people who are disadvantaged with food, food vouchers, payment of prescriptions, clothing vouchers, assistance with paying bills, advocacy, referrals and crisis counselling. DRERS is now seeking donations of sleeping bags.